Haydn’s symphonies, oratorios, and his operas leave one stunned at his inventiveness, but it’s the smaller ensemble works and piano sonatas that capture my heart. Herewith some of the gems from the bumper crop of Haydn Year releases. Franz Joseph HAYDN: String Quartets Op. 20 No. 4; Op. 64 No. 6; Op.77 No. 1. 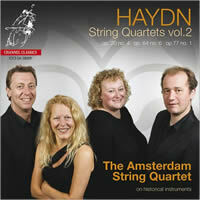 The Amsterdam String Quartet: Alida Schat, John Wilson Meyer (vlns), Jane Rogers (vla), Thomas Pitt (vc). Channel Classics CCS SA 28209 (SACD hybrid CD) (http://www.channelclassics.com/). Distributed in the US by Harmonia Mundi (http://www.harmoniamundi.com/). Franz Joseph HAYDN: String Quartets Op. 50 Nos. 3, 5, 6. Pražák Quartet: Václav Remeš, Vlastimil Holek (vlns), Josef Klusoň (vla), Michal Kaňka (vc). Praga Digitals PRD/DSD 250251 (CD) (http://www.pragadigitals.com/). Distributed in the US by Harmonia Mundi (http://www.harmoniamundi.com/). The Amsterdam Quartet is a period-instrument group, and while I recognize that doesn’t necessarily mean scratchy, ugly sounds that assault the ears, it does raise a red flag for me. So you can imagine my joy when I placed this disc in my player and heard the full-bodied, warm, beautiful sound of four perfectly matched instruments and players — just listen to the sweet sounds of the violins here and the way inner voices emerge effortlessly from the ensemble. The Op. 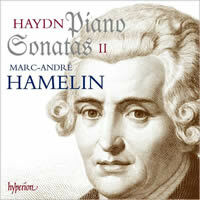 20 set is regarded as Haydn’s first mature works in the form, the others on this disc are from his later period. All are expressive, elegant, and full of the musical surprises common to Haydn’s wondrous chamber works. The Amsterdam Quartet fully captures their vigor, with thrusting outer movements and flowing slow ones. Channel Classics’ engineering, always among the best in the industry, enhances their effect. This is a hybrid disc and while both layers sounded magnificent, the SACD layer, heard in my system in stereo, had the edge for presence and clarity. By the way, note that this is Volume 2. Volume 1 came out in 2007 and it’s every bit as good (Channel Classics CCS SA 25907). Don’t be put off by the cover of the Pražák Quartet disc of a trio of works from the Op. 50 set, called the “Prussian” Quartets because Haydn dedicated them to Friedrich Wilhelm II, King of Prussia and supposedly a good cellist. The Pražáks are a dynamic group, their spirited playing full of Haydnesque vigor, so why a cover depicting a Jane Austen-type lass with a snake-like little finger reading a book (actually it’s a detail of a Fragonard painting, La Liseuse, aka The Reader). It may be a far-out notion, but I suspect the association of Haydn’s music with peaceful domestic pursuits or romanticized pastoral settings (see below) via such cover art reinforces the comfortable image of “Papa Haydn,” thus reducing the scope of a composer who was a revolutionary musical force. That digression aside, if you’re familiar with the Pražák’s earlier account of the great Op. 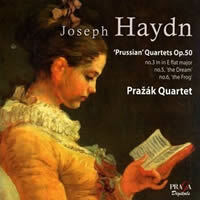 76 set you’ll know they are terrific exponents of Haydn’s music and this new entry makes me hope that Praga will keep them busy with the rest of Haydn’s quartet output. Their ensemble sound is perfectly blended, inner voices are always audible, and, given Haydn’s dedication of the Op. 50s to a cellist, the cello, often covered by lesser groups, is a full partner. Vivid sonics augment an outstanding contribution to the Haydn Year. Franz Joseph HAYDN: Piano Trios, Hob. XV 2, 5 -12. Beaux Arts Trio. Pentatone PTC 5186 179 (2 SACD hybrid CDs) (http://www.pentatonemusic.com/). Distributed in the US by Naxos (http://www.naxos.com/). 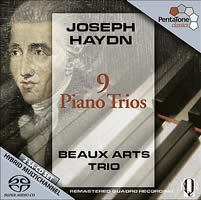 Franz Joseph HAYDN: Piano Trios, Vol. 1: Hob. XV: 24-27. The Florestan Trio. Hyperion CDA67719 (CD) (http://www.hyperion-records.co.uk/). Distributed in the US by Harmonia Mundi (http://www.harmoniamundi.com/). 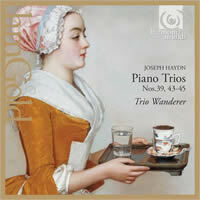 Franz Joseph HAYDN: Piano Trios, Vol. 2: Hob. XV: 28-31. The Florestan Trio. Hyperion CDA67757 (CD) (http://www.hyperion-records.co.uk/). Distributed in the US by Harmonia Mundi (http://www.harmoniamundi.com/). Franz Joseph HAYDN: Piano Trios, Hob. XV: 25, 27-29. Trio Wanderer. Harmonia Mundi HMG 501968 (CD) (http://www.harmoniamundi.com/). Beaux Arts Trio and the groups listed above offer a treasure trove of delights. Haydn’s string quartets are rightly considered masterpieces, even the earliest are gold-star products, but his less familiar Trios are as worthy of our attention. The Beaux Arts set is drawn from their 1970s Philips recordings of the complete Piano Trios and while there’s no indication Pentatone will make the others available in hybrid SACD format, let’s hope they will — and soon. The Beaux Arts Trio was in its glory days when they made their landmark Haydn set — Menahem Pressler (piano), Isidore Cohen (violin) and Bernard Greenhouse (cello) were all outstanding musicians and their performances are as gorgeous as one could wish, with a warm ensemble sound and a comfortable gemütliche approach that doesn’t exclude an adequate helping of zestful dynamism joined by the poetry and silky smoothness of their playing. Pentatone’s remastering, heard in SACD stereo, is open, warm, and present. 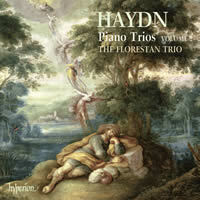 The Florestan Trio score mightily in two discs of mature works from Haydn’s 1790s London visits. These late works fully explore the possibilities of the trio form, with greater independence for the strings, richer textures for the ensemble, and, thanks to the new, more sonorous English pianos, keyboard writing that exploits the instrument’s power and brilliance. Susan Tomes is superb in these works; her fluid pianism is a joy to hear, beautiful in tone, crisp in articulation. Violinist Anthony Marwood and cellist Richard Lester are on her level, and the tightly knit ensemble delivers a full, rich sound along with lightning-fast reactions to Haydn’s many twists and turns. 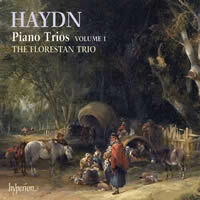 There are plenty of those twists and turns too, for the Haydn of the late Trios never missed an opportunity to surprise with daring harmonies, mood-breaking pauses and deep emotions that point directly to the later Romanticists. Some, like Hob. XV: 26, have an improvisational feel to them, so in a performance as attuned to their spirit as this one, it sometimes seems that the players are spontaneously creating the work anew. In others, there are concerto-like passages as in the Allegro movement of Hob. XV: 31, where the violin emerges with attention-getting virtuosity. And there’s an expressive range and depth in works such as Hob. XV: 28 where a surprisingly operatic Allegretto precedes a Finale full of harmonic progressions that would have startled 1790s listeners. The Florestan make them sound fresh to today’s listeners too, playing with the strength and subtlety, drama and humor that abound in these marvelous works. Hyperion’s sound is full-bodied and detailed. Trio Wanderer is another outstanding ensemble. Their recordings often overlap the Florestan’s repertory and when that happens it’s hard to prefer one over the other. This Haydn disc is a reissue of a 2001 release now available in Harmonia Mundi’s midline HM Gold series. The Trio Wanderer shares with the Florestan Trio such virtues as a seamless, full-bodied ensemble sound led by a pianist (Vincent Coq) whose playing is crystal-clear, with precise articulation and tonal shadings. Violinist Roland Pidoux and cellist Jean-Marc Philips-Varjabédian are as fine, with the latter’s cello never swamped by the piano, an occupational hazard in Haydn trio performances. Like the Florestans, they bring lots of energy and wide dynamic contrasts to these late works. I wouldn’t be without either group. Timings are fairly close but tempos do vary. In Hob. XV: 29, the Wanderers wander a bit more in the Andantino taking a half-minute longer than the Florestans, a clue to their more expressive, lyrical take in this piece, but they’re a half-minute faster in the Finale, which they play with more emphatic phrasing. But you can’t generalize: In Hob. XV: 28, it’s the Wanderers who chop a half-minute off the Florestan’s timing in the Allegretto, while the Florestans are more expansive in the first movement. The timing game never tells the full story, though in the relatively short movements of the Haydn Trios it does offer minimal guidelines to interpretive differences. Perhaps the most popular of the Trios — if “popular” is the right word in the context of neglected masterpieces — is Hob. XV: 25. What a remarkable gem this is. The slow movement is achingly beautiful, what a classical music station host of my youth called “Super OTW” (OTW, out of this world). Here, the Florestans are almost brisk, the Wanderers almost schmaltzy. But both tear into the Gypsy Rondo finale, marked Presto, with impulsive abandon. Don’t look to me for a bottom-line recommendation; I’d just say get them all. Each group has something valid to say about Haydn’s late masterpieces and each says it with style, polish, and energy. Franz Joseph HAYDN: Piano Sonatas, Vol. I. Marc-André Hamelin (pno). Hyperion CDA67554 (2 CDs) (http://www.hyperion-records.co.uk/). Distributed in the US by Harmonia Mundi (http://www.harmoniamundi.com/). Franz Joseph HAYDN: Piano Sonatas, Vol. II. Marc-André Hamelin (pno). Hyperion CDA67710 (2 CDs) (http://www.hyperion-records.co.uk/). Distributed in the US by Harmonia Mundi (http://www.harmoniamundi.com/). Hamelin is best known for championing composers whose neglect is due in large part to compositions that very few pianists can — or dare — play. But Hamelin plays them, and more to the point, plays them with an ease and mastery that verge on the unbelievable. 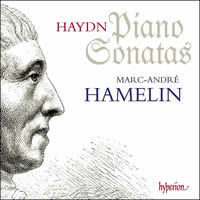 He’s recorded some Romantic staples too, but these new Haydn releases demonstrate his artistry as well as, or even more than the knuckle-busting virtuoso fare on which he built his reputation. For these are among the greatest Haydn piano recordings ever made, blending style, elegance, virtuosity, and interpretive insights to project these works as the masterpieces they are. The appeal of these sets is heightened by their value — each two-disc slimline set contains about 2 ½ hours of music at two-for-one pricing. Included are 19 sonatas, each a gem, along with the brilliant Variations in F and the Fantasia. In Volume II, the Variations (here titled Sonata “Un piccolo divertimento”), Hamelin begins with an elegantly phrased melancholic opening, proceeds through alternating major-minor variations, and ends with a powerful, remarkably intense finale. Some “divertimento”! Hamelin plays these works with all the grace of the era’s style, and also exposes the powerful emotions underpinning much of the music. So he captures the intimacy of the achingly beautiful Adagio movement of the E flat major Sonata, No. 49, and follows an equally soulful performance of the Andante movement of the D major Sonata, No. 42 with a quicksilver finale of breathtaking virtuosity. The above examples come from Vol. II, but the first volume is also one of those perpetual highlight sets where virtually every piece inspires awe for both the perfection of the music and the playing. Hamelin brings out the wackiness of Sonata No. 50’s finale, enlivening such humorous movements (and there are plenty of them throughout these discs) with hair-trigger timing and varied tonal colors. His legato playing in slow movements is stunning, reinforcing the classical ideal of instrumental “singing tone and phrasing.” Everywhere, his articulation is crystal clear, so when he adopts faster tempos than we usually hear in these works, they never seem too fast because each note is perfectly articulated. Most important, Hamelin finds in this music what so many performers of Haydn miss — the universality of utterance, the almost Shakespearean range of emotions, hiding within the classicism of Haydn’s musical language.